When Jaws was released in 1975, it spawned a whole new category of theatrical film: The Summer Blockbuster. Pretty much a perfect film in every way, Universal is releasing the film on Blu-ray for the first time on August 14, 2012 as part of Universal’s 100th Anniversary. To coincide with this release Newmarket Press is publishing a new expanded edition of the book The Jaws Log. The Jaws Log has long been regarded as not only the definitive book on the making of the movie Jaws, but it is also acknowledged as one of the best books about making movies ever written. First published in 1975, The Jaws Log was written by Carl Gottlieb, who co-wrote the screenplay for the film Jaws. The book chronicles the making of the film from the very beginning, all through Gottlieb’s eyes and his brilliant and honest words. Gottlieb’s writing style reminds me of the way Spielberg himself directs a movie. It is very specific, written with a wit and style that is enticing, and with a flair that makes it very difficult to not read through the entire book in one sitting. He is honest and humble and very fond of his memories making the film. His genuine feeling shine through every word and it just may be that sincerity that makes the book so engaging. With authorization from Spielberg, Gottlieb tells stories of the famous mechanical shark, Bruce, Spielberg’s frustrations with it, and the reactions of critics and audiences worldwide when Jaws eventually hit the big screen. Filled with humorous anecdotes, The Jaws Log contains stories involving, and often directly from the mouths of, Spielberg, Scheider, Dreyfuss, Shaw and producers Zanuck and Brown that made you yearn for the life of a filmmaker and fear it at the same time. From stories of Spielberg taking the job assuming he could just hire a shark wrangler and use real Great White’s in the movie (which of course was a false assumption), to the eventual release of the film and the madness caused by the public’s reaction to the film, Gottlieb leaves no stone unturned. 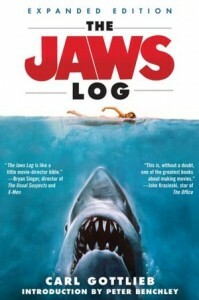 Since its release in 1975, The Jaws Log has sold over 2 Million copies and has generated 17 printings. The new expanded edition includes a 22 page section of excellent behind the scenes photographs portraying everything from prepping the shark cage with an ominous Bruce floating nearby underwater to Gottlieb’s own fall into the ocean waters while filming. Also included are an introduction by Jaws author Peter Benchley and an introduction by Gottlieb himself. Definitely one of the best books I have ever read on the making of a film, The Jaws Log is entertaining, informative and insightful into the making of one of the most iconic films in history.